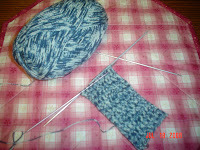 I began a new pair of socks for me! I fell in love with the mosaic blue yarn from Opal that I found on line. The pattern is a tried and true one that I have made several times -- Ann Norling's Wide Wale. I am using size 2 dpns. Opal yarn is a German sock yarn that comes in many colors and types. I usually like working with the 6 ply yarn, but the mosaic blue colors just "spoke" to me.